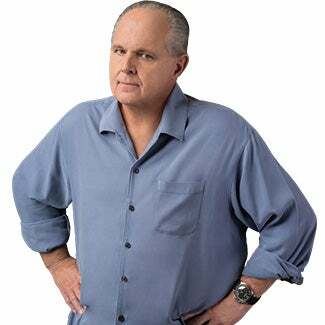 RUSH: They’re voting on net neutrality today. Ajit Pai running the FCC and man, folks, the panic is all over the place. Do you remember — some of you might remember this name. Some of you might not. Does the name Sandra Fluke ring a bell? Well, Sandra Fluke apparently has been recruited to help the anti-net neutrality forces marshal their action today to protest the vote, which is gonna happen, and the Obama era net neutrality regulations are gonna be relaxed, which is good for an open internet. If you’ve ever had any doubts about what this is, this ought to end them. Net neutrality is nothing but another one of these uber-left-wing socialist, slash, communist causes that expands the government and gives it total regulatory power over the internet. There are other tweets today claiming climate change depends on net neutrality. If the net neutrality rules and regulations are relaxed today, that that’s bad for climate change. You want a little irony or hypocrisy? From The Daily Wire: “Hollywood Celebrities Throw Christmas Fundraiser — For Planned Parenthood.” Now, you might thinking, “So what, Rush. So what.” Well, what is Christmas? It’s celebrating the birth, b-i-r-t-h, virgin in front of it, celebrating the birth of Jesus Christ. And now you have a variety show fundraiser for the organization that ends the lives of so many babies before they’re born. And they are Hollywood. What is it, 1.3 million abortions a year at the peak. I don’t know what it is now. So abortion celebrated all over the left today, net neutrality, even have some audio sound bites on this. CLYBURN: (shouting) We’re right next door to a place that is gonna make a significant decision today! But we’re right next door to some people who speak for those who recognize that equality over the internet is a right! CLYBURN: This is about internet equality! CLYBURN: Internet equality, net neutrality! We will win at the end of the day! RUSH: Very got confused there. Internet! Internet? What is that, “internet newquality”? She meant to say “internet net neutrality.” (sigh) Never has there been a more misnamed, fraudulent, phony issue than net neutrality. They want you to think that putting the government in charge of it and regulating it is gonna keep everybody on it equal and the same. (chuckling) It’s the exact opposite! They want to turn the internet into a utility, is what they mean. They want it regulated like the power company is and like the phone company is. They want it regulated by the federal government, because they run the federal government, in their minds, and they want control over the internet. And they want to be able to punish cable providers, and they want to be able to punish the ISPs. They want to punish AT&T. They want to punish Comcast. They want to make ’em pay. They hate ’em! The only thing that young people care about on internet is Netflix. If you could find a way to make Netflix free, they would forget about opposing anything else you wanted to do there. That’s a bit of an exaggeration. Here’s Ed Markey, Democrat — he’s senator now — from Massachusetts. He was also at the net neutrality protest. MARKEY: That they can say, “Yes (sic), she persisted,” that it is possible for any voice, no matter how small, to be online. That any company, no matter how small, can get online without fear of having themselves tipped upside down and having money shaken out of their pockets by the big broadband barons. RUSH: (impression) “So! We! Must! Have! “Net! Newquality! So! That! We! Can! Have! Black! Lives! Matter! And! So! That! She! Can! Say! She! Persisted! And! So! That! We! Can! Make! Fools! Of! Ourselves!” And then you go back to Sandra Fluke: We need net neutrality or women are not gonna be able to find out how to get abortions. It’s like magic, folks. When the FCC votes to roll back Obama-era, oppressive regulation of the internet, immediately women are gonna be walking around dazed and confused! Not knowing where to go to abort their babies. Not knowing where to go to find out where to go. Not knowing where to go to find out how to do it. Not even to find out where the back alleys are! Because net neutrality is gonna take away all of that information. Net neutrality is gonna take away Black Lives Matter. The people that believe in Black Lives Matter are somehow magically gonna lose access to the internet. You think this is about the internet? You look at these people making fools of themselves in this protest, the things they’re saying. If anything should tell you that this is nothing but the latest dazzling cause of the day for the uber-left, it’s all these sound bites. SCHUMER: If net neutrality is eliminated, the internet may resemble a toll road with the highest bidders cruising lining private, fast lines, while rest of us inch along on a single traffic-choked public lane. We could be forced to purchase internet packages much like cable packages, paying for more popular sites. It’s hard to imagine an entrepreneur building the world’s next revolutionary billion-dollar company while she (sic) sits in a bumper-to-bumper traffic online. RUSH: All right. Well, let me ask a question: Obama-era net neutrality rules are basically two years old. The internet came into existence from literally nothing and blossomed into what it was with anything you wanted. You can find anything you wanted, and you could buy different speeds. You could buy different packages. You could buy whatever you could afford, you could buy whatever you wanted, and look at what happened to the internet. It grew and grew and grew, and these people in Washington are sitting there seething that they don’t have any control over it. Think back 10, 15 years. How bad was the internet? Look at all that was there, and it was free. You want the New York Times? It was free. You want anything; it was free, because they didn’t know how to monetize it at first. Then they started doing paywalls, but that had nothing to do with internet regulation. That had to do with profit. So if you wanted to read the New York Times on the internet and you didn’t have a subscription, lo and behold, you had to pay for it. Why would that be? Well, it costs them to produce it, or anything else. My point is for the first 15 years of the internet, you could do anything you wanted on it. You could access anything you wanted on it. It was wide open. It grew and it created multibillionaires left and right. There was nothing wrong with it except the left didn’t have their hands on it. Here comes Obama, net neutrality, some… You know, net neutrality is the same as affordable health care for all Americans. There wasn’t nothing affordable about Obamacare, was there? You remember, “You get to keep your doctor and keep your plan if you like it”? They’re doing the same lying technique here with net neutrality. RUSH: You know, we’ve only had net neutrality for a couple of years. What did women do to find out where to go to get abortions before that? Does anybody know? How did it happen? It must have been really tough, must have been really arduous. Because you go back three, four, five, as far back as many years as you want, we didn’t have net neutrality, and yet abortions happened. How?